I am in my studio sitting in front of my computer cursing; there is a particularly virulent form of Adware parked somewhere that is popping up maddeningly everytime I try to use Safari. Expletives spew from my sailor mouth as I had planned on a quiet contemplative writing session backed with a little Googling research. Now I am on hold as I have dialed Apple Support and am waiting on my new BFF to help me out. It is dusk, nightfall is descending, and that’s when it always starts—the incessant loud chirping that has been disturbing my sleep for the last few weeks. I’ve tried shutting the windows in the house but the calls are so loud that I can hear them through the walls. First I had asked my tree-hugging, neighborhood sleuth what kind of bird she thinks it might be but she has no clue. In frustration one day I drive directly to the birdseed store and an astute clerk immediately plays me a recording of the offending sound which turns out not to be a bird at all but a tree frog! But I digress. My art studio sits in the middle of my backyard garden, the windows and doors opening out into the yard so that it feels as if one were actually outside. I am sitting here listening to my newly identified tree frog call to his mate as if his life depended upon it when the Apple lady finally comes on the phone. As she asks permission and then magically takes over my computer, I strain to hear what she is saying above the din of this tiny tiny creature sitting on a leaf, a twig, or a blade of grass somewhere in my garden. Finally she asks in exasperation what the infernal racket is in the background. ‘It’s a tree frog’ is my original reply and she is appropriately dumbfounded. When my yellow lab was alive she was always with me in the studio at night. She’d alternate napping on the couch with stalking the perimeter of the unlit yard for possible critter intruders. As she grew older and lost her hearing she became anxious about me not being in the house with her and my husband after nightfall. Her solution was to sit on the deck of the house and wait, staring at the studio as if she could will me inside with her incredible concentration. Of course her theory panned out everytime as eventually I would turn out the studio lights and walk toward the house and as I approached I could hear her let out a big sigh as she stiffly pulled up her body and turned toward the door, toenails clicking softly on the wooden deck floor. Now I have a cat— the lab is gone, the husband is gone. The rescue organization where I got this feline made me promise not to let her outside but she does go out onto the screened in porch which looks out directly to my studio; she sits on the wicker chaise and she waits. Just like the dog she worries when I am not safely inside. When I finally make my way toward the house I can hear the thud of her little paws hit the porch floor running as she gets ready for me to open the door and go inside. Soft, sacred sounds these are and I bow my head to them. The old dog sighing, the toenails clicking, the tiny little feline paws hitting the ground with a thud, sounds that have been and are so much a part of my everyday living that they do (and still) echo in my brain many years later. 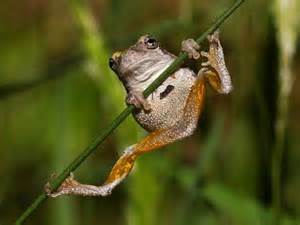 Which brings me back to the chirping tree frog clutching his branch with all his might, calling out to his mate night after night, wondering why she is not with him, why she is not safely inside. This entry was posted in Image & Word on July 18, 2015 by laura.